"This is a place of peace; this is my home." No matter how old I get, animals and their creation still baffles me. How do, for instance, my cats and dogs know the sound of my voice or know what time of day they are routinely fed? To say that animals aren't as smart as humans is preposterous. Animals learn things without the benefit of being able to speak, read, or even show much more than simple emotion. What is even more amazing to me is how large numbers of animals exist in the wild, adapting to their surroundings as they fight off the horrors of predators, droughts and poachers. Perhaps the greatest example of these creatures are the elephants—with their enormous bodies and amazing white tusks, these are simply marvelous animals. Africa's Elephant Kingdom is a beautifully filmed, and amazingly sweet look at the intimacy that exists in a family of elephants. Narrated by the heavy, baritone voice of Star Trek: Deep Space Nine star Avery Brooks, this IMAX documentary is certainly one of the best I have seen. Told from the perspective of a sixty-year-old bull, Africa's Elephant Kingdom takes its viewer for an up close look at a large herd of Kenya's Amboseli National Park. From the birth of two babies to the threat brought on by heavy drought to the discovery of a deceased newborn by the herd, Africa's Elephant Kingdom is as entertaining as it is informative. What is most fascinating about Africa's Elephant Kingdom is how similiar the elephants' nature is to human nature. As we follow the herd, they hunt for food and water during a drought one of the elephants collapses from the heat and lack of water. Within minutes, the others encircle the great animal, working to push and move the elephant until it is brought back to its feet. Moments like these are what makes this better than other documentaries about the wild. With the assistance of a helicopter, balloon, flatbed trucks, rafts, and a large crane, director Michael Caufield dazzles the viewer with his cinematography. He takes us inside the world of these elephants for an experience that, while not as impressive at home as it was in large IMAX theaters, is still something to behold. Image Transfer Review: Presented in a full frame transfer, Africa's Elephant Kingdom looks great, with only one exception: during the opening shots of the herds moving across the plains there is excessive grain that distracts from the beauty of the rest of the image. Colors are vibrant with the more muted tans and browns also coming off well. Detail is stunning, especially in the close-ups of the elephants. There are no visible signs of edge enhancement or pixelation that I saw; overall this is a fine transfer with only one chink in the armor. Audio Transfer Review: The Dolby Digital 5.1 mix for Africa's Elephant Kingdom is far from being reference quality, yet the disc sounds as good if not better than several feature-length action movies. From the opening moments that feature African drums and chants to the soft, subtle, ambient sounds of the elephants moving across the land, this mix really impresses. The .1 LFE channel is for the most part dormant, and dialogue sounds clean and is easy to hear as it is well mixed with the other speakers. A Dolby 2.0 channel mix is also provided. Extras Review: For the first time that I have seen, Africa's Elephant Kingdom features a making-of documentary that is longer than the feature itself. Clocking in at fifty-two minutes (the feature runs just over forty), this piece is interesting and informative. Covering every aspect from choosing location to getting close enough to the herd to film, everything you would ever want to know about making an IMAX film is covered here. The documentary gets a bit tedious towards the end, but it is still interesting to watch once. The theatrical trailer as well as a web link to Discovery.com are also included. 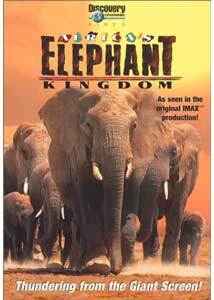 Africa's Elephant Kingdom is a wonderful DVD presentation of an IMAX film. The feature itself has a short running time, but the disc is reasonably priced at around $15.00 at most retail stores. Recommended to those hoping to learn more about animals in the wild.